In early February friends Jennie and Chris Gash (NB Tentatrice) came to pick me up for a short stay at their home in Bromsgrove. We had planned this visit some months back and it came at a time when I was feeling lower than worm's belly button with the first anniversary of Les' death just behind me and the first anniversary of his cremation looming in front of me on February 14th. Sunday, February 4th dawned crisp and clean. It was to be the last really mild winter day we in Britain would have for some weeks to come. Jennie and Chris picked me up early in the afternoon. The drive down to Bromsgrove was interesting as I was astonished to see canals weaving all around their home town. Well of course Bromsgrove is on the outskirts of Birmingham so there is that, but the Stratford-Upon-Avon canal is also nearby as is the northern Grand Union and the Droitwich canal is close as well, where NB Tentatrice is harbored over winter at Droitwich Spa Marina. Jennie was kind enough to offer the use of her washer and dryer so laundry commenced and a Chinese take away was ordered for dinner. After dinner more wine was poured, stories were told and pictures came out of boxes and cupboards, refreshing memories and adding another layer to the story of their lives. Chris was a navigator in the RAF and they were posted to more than ten sites in his career. Jennie was also in the RAF and that is how they met! I saw a brilliant photograph of the two of them in their late mid to late twenties, about to board a Vulcan bomber. Chris and Jennie were the only married couple to have ever flown in one together. I hope they have it framed and hang it on the wall. It is an absolutely amazing photo and they both look like models in an advert for joining the RAF. In 1095 Mowbray took part in another rebellion which objective was to stop the succession of the crown to the conqueror's sons and pass it to Stephen of Aumale. For his efforts Robert of Mowbray was taken from his stronghold at Bamburgh Castle, and imprisoned for many years at Windsor before finally being released to become a monk in his later years. He died without issue in 1125 and the house and grounds in Warwickshire were passed on to Robert's brother Nigel de Abigny who married his deceased brother's wife. The land remained in the de Mowbray family for four generations before being sold to Walter de Bisenge whose Great granddaughter Mazera married Thomas de Clinton in 1225 and the lands and house passed into the Clinton family. Three generations passed and it was sold to a Coventry merchant named Nicholas Dudley who sold the property in 1400 to Robert Burdet and his wife Joan. On her husband's death Joan enfeoffed three men all named John: John Dugdale, John Sperman and John Brome. An enfeoff is a feudal term for essentially renting a room in a manor house or castle or a bit of land to someone in return for their fealty and willingness to defend said house and land in time of war. Now, while these three men were living on the estate, it was sold several times until it ended up at last in the hands of John Brome who was listed in 1438 as the "lord of said manor." John was murdered in at White friars, London in 1468 by one John Herthill and the house passed to his son Nicholas. Nick had a temper; he avenged his fathers death by killing Herthill as well as a local parish priest who had the audacity to flirt with his wife and was caught in the act by Nicholas. At his death in 1513 the property passed to his two daughters, one of which signed her half over to her sister and her husband Sir Edward Ferrers. The house remained the Ferrers family for twelve generations. 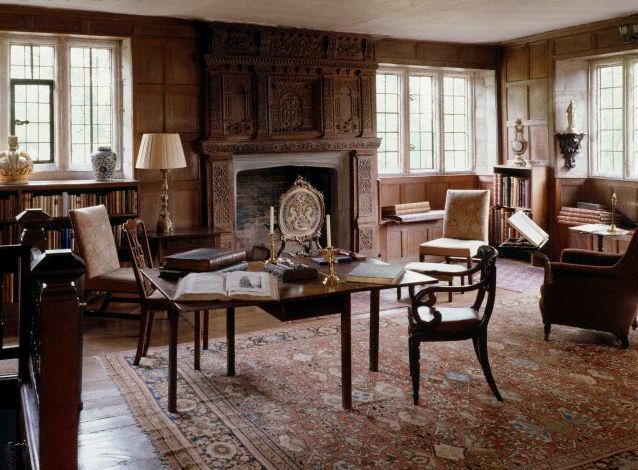 The estate was sold in 1937 to Mr. Edmund Walker from Knowle who eventually gave it to the National Trust. Originally this home was a moated manor with a drawbridge--obviously built for defense. Most of the present day house is from the 15th century with a few timbers and walls still left from the 13th century. There is a cellar passage reached by a trap door in the brew house under th south side of the moat. This passage travels through the house within the walls to exit near the North Gateway. This is an important detail because all of the owners and inhabitants of Baddesley Clinton have been Catholics. A view from the Northeast of the moat and the bridge which was a drawbridge at one time. Interior courtyard with entrance to the kitchen/scullery which is now the main entrance. The left inside of the courtyard. The old wooden door was the original entrance to the house. 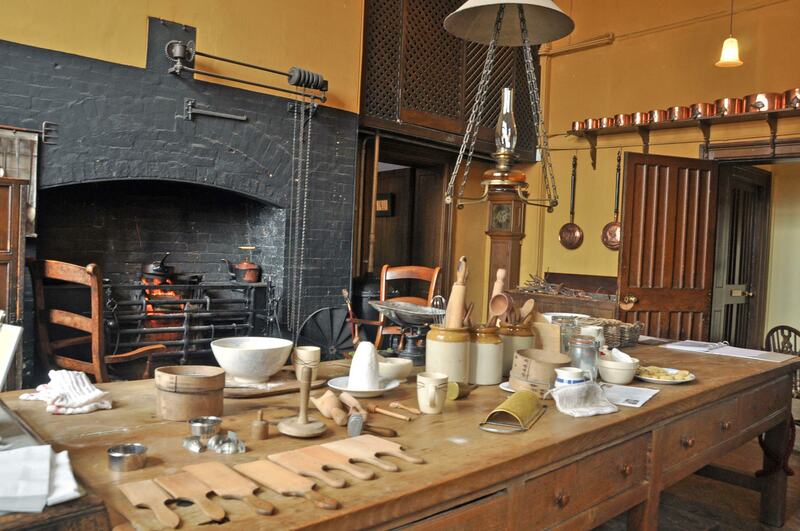 Kitchen/scullery. the left out of site is one of the priest holes that leads to the sewers. The stairs lead to a priest hole hidden behind sliding paneling and the fireplace. This is known as the moat room for its location adjacent to the bridge on the north side of the house. The actual space behind the fireplace and paneling. 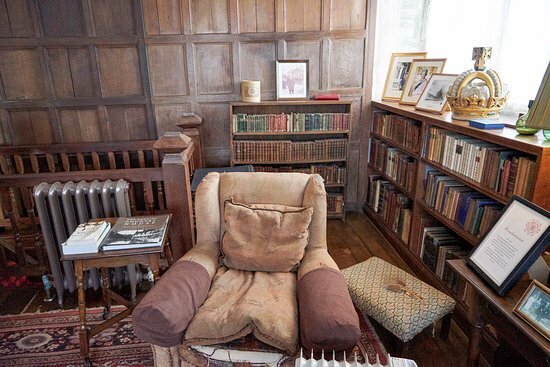 The library where Nicholas Brome murdered the parish priest for flirting with his wife. One bookshelf in the library. My hands itched to pull books and peruse their pages! So many books....no, no! Mustn't touch!! Looking down inside one of the priest holes. The 13th century garderobe room. The trap door is located underneath the large chest at the end of the room with the candle in front of it. In the 17th century is was used as a sacristy. The door on the right leads to the Catholic chapel. The chapel with its beautiful panels covering the walls right, painted on calfskin. The large leather painted panels up close. Armorial windows were installed beginning in the 17th century with the Ferrers. The armorial designs provide detail of each Ferrer and his chosen wife. The cellar passage was originally a sewer, designed to be flooded periodically by raising the level of the water in the moat which would carry most of it away. As the water level was lowered again a servant would access steps at the far end of the passageway and brush it out. Catholicism was outlawed outright in 1580 after decades of seesawing back and forth with Henry VIII's break with Rome over his marriage to Anne Boleyn, Henry's death and the succession of his son who died at the age of thirteen to be followed to the throne by Mary--Henry's daughter with his first wife Catherine who was a staunch Catholic, and finally under the reign of Elizabeth I, a Protestant. By 1580 one could be executed for practicing Catholicism and anyone missing an Anglican service was fined £20 per month. To put this in perspective, twenty pounds in 1580 is equivalent to £ 3,300.00 today! After 1589 any priest ordained abroad since 1559 and discovered on English soil was branded a traitor and his lay host became a felon both punishable by death. In 1593 Catholics could travel no more than fie miles from home without forfeiting all property and had to apply for a license for travel from local authorities if they desired to leave their hamlet, village, town, or city. Catholic rites and services were banned and priests, if found, were executed. It was under these conditions that Catholics--especially priests--were welcomed and offered sanctuary at Clinton Baddesley. The sewer passage became a hiding place and a means of escape from authorities who visited known Catholic sympathizers frequently in the hopes of finding anything and anyone which might allow them to arrest the owners. It was not uncommon for up to eleven priests to hide at a moment's notice, by climbing down a rope, hand over hand to the bottom of a bolt hole into the sewer where they might have to wait for days on end as the house was searched and watched. They had to be very careful not to leave anything behind--not a rosary, a robe, or a missal. Sixteenth century architect Nicholas Owen supported his faith by building priest holes in the manor houses and castles of staunch Catholics. Clinton Baddesley has four such holes built by Owen; two connect to the sewer which eventually led to the north gatehouse. One is located in the pantry area of the servant's kitchen, one is located in a downstairs "moat room" behind movable paneling next to a fireplace, and the third leads into the ceiling and is said to hold up to six people. The fourth was located on the second floor in the Garderobe which in medieval times was a room with a shaft that dropped from a hole in a bench to a shaft on an outer wall, allowing one to release one's waste which dropped down the shaft and out to the ground or the moat as the case may be. Since fresh air came in via the shaft, bringing the pong of poo with it, it was thought a good place to hang one's garments in order to fill lice infestations! In the 16th century at Baddesley Clinton a rope was hung from a cross bar over the top of this hole and a secret wooden hatch was fitted over the opening to mask it and a large wooden chest was placed over the top. The garderobe was located adjacent to the room used as an altar for prayer and worship, making it easy for contraband persons to move the chest, open the hole and climb down to the sewer passage at the bottom while a family member put every thing back together, smoothed their hair, straightened their clothes, took a deep breath and marched off to greet the priest hunters pounding on the gatehouse door. Warwickshire was a hot bed of Catholicism. 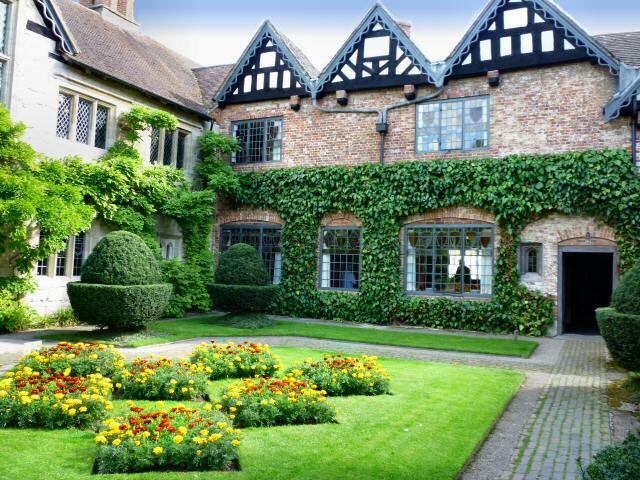 William Shakespeare's family were Catholics and related to the gentry at Arden Castle by his mother Mary Arden. Catholic servants, peasants, gentility and nobility all looked out for one another across the country. In 1603 Henry Ferrers was serving as the Sheriff of Rutland and an MP for Cirencester though he had long since sold his land in the area. It is thought Henry may have been involved in the Gun Powder Plot. (For those who are not familiar with British history you can read about this "explosive" moment in history by clicking on the link in purple.) Henry owned the house next door to the Houses of Parliament acquired by plotter Thomas Percy in 1604. Guy Fawkes stored the gun powder which gave this plot its name in Percy's house yet once the traitors had been caught, the barrels of gunpowder sitting under the floor or parliament confiscated and moved to safety, and those held responsible sentenced to death, not a mote of suspicion attached itself to Henry Ferrers and proceedings were never taken against him. After lunch at the cafe Jennie and I walked up the rutted dirt lane known as the Heart of England Way to the parish church of St. Micheal. There has been a church on this site since 1305, originally dedicated to St. James it was changed to St. Michael sometime in the 19th century. church: "standing up right within the church door so that people may tread upon me as they enter." The Heart of England Way or the rutted lane to St. Michael's parish church from Baddesley Clinton Manor house. The front of St. Michael overlooking the graves of countless generations of parishioners. The interior of this bijoux church is bright and inviting. The ceiling is 17th century woodwork. 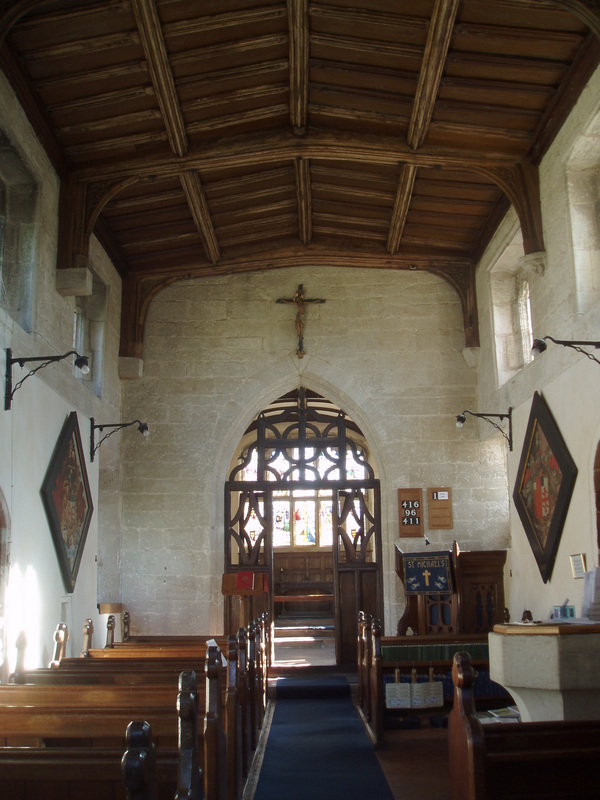 The Lords of Baddesley are buried under the floor stone in the chancel which has its original 15th century coffered roof. 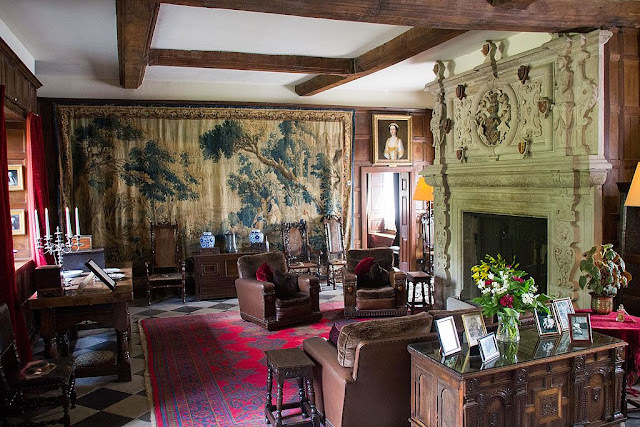 There is a lot more history surrounding this manor up to the 1930's but I don't have room to share it all so you will have to make a trip to Baddesley Clinton yourself! You won't be disappointed. My deepest thanks to friends Chris and Jennie Gash for driving all the way up to Cheshire, scooping me up, sharing their lovely home with me and showing me a lovely time. Much love to you both as your summer cruising moves forward. What an amazing description of Baddesley Clinton. I love it (your description, the fantastic photos and the place!) I've never visited this property but it has now jumped onto my 'To Be Visited One Day' list! Loved seeing the pictures! Wow! Trying to imagine life there. That is somewhere I would like to visit. I was thinking of you the other week as I was looking at photos of my trip to the USA last year and that chance meeting we had at Heathrow. You are most welcome Karen, Glad you could come along vicariously! I really enjoyed my day out with Jennie. She is a lovely host as you well know and I the trip to Baddesely Clinton was fascinating. I am pleased my post did the property justice and I look forward to reading your post after you visit! I hope spring has sprung at last in Tennessee. I think you would love Baddesley Clinton and some of the other National Trust properties. There are a fair few not to far from the canals. I love your new blog 62 and the next 10. Our most recent post about Ludgate and the Blackfriars area brought me back to April 2013 when Les and I visited London and explored Fleet Street. We were looking for the four dragons that guard each of the four entrances into The City. One is located on Fleet street and it led us to St. Clement Danes church with its touching memorials to the RAF and the air force of other countries who were allies in WWII. Mrs. Thatcher's funeral was the next day and we walked in to the route being planned at St. Clement Danes. We carried on up Fleet St. and just before the Old Cheshire Cheese Pub we found the Bolt Court snickelway or ginnel. It leads between the buildings on Fleet street and veers to the left to connect with Hind Court. There are the end is a courtyard with seats around a small back statue of Dr. Samuel JOhnson's cat. His house is at the end of the courtyard. It was a lovely surprise for us both. Les was born and raised in West London and he thought he knew the city like the back of his hand. He knew all the main streets but with me we discovered the hidden catcreeps and unusual features of the city--all for free. Your wonderfully well researched and written post brought back lovely memories of time in London with my Best Beloved. I could see you as a volunteer guide in one of their properties!